Keen to capture a European car battery value chain that will be worth an estimated 250 billion euros ($290 billion) by 2025, the European Commission launched an alliance of local companies last year aiming to build 10 to 20 huge battery factories. But only Sweden's Northvolt has plans for large lithium-ion battery factories in Europe so far, and some leading European carmakers have already struck deals with Asian suppliers that are setting up in Hungary and Poland. 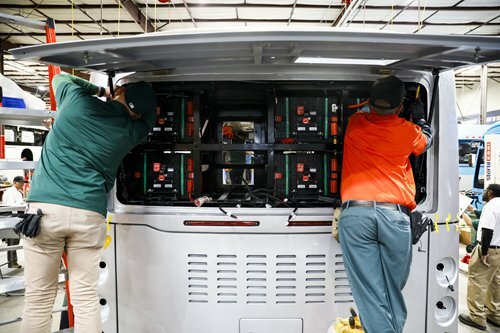 "We are considering cell production outside of China and that includes Europe," Julia Chen, global sales director at BYD Batteries, told Reuters, speaking about the production of vehicle and home storage batteries. BYD, which also makes electric buses, cars and solar panels, said it was not clear where in Europe a battery site might be. "It would be possible wherever there's a market," she said. The company, which is backed by Warren Buffett's Berkshire Hathaway, joins South Korea's SK Innovation, Japan's GS Yuasa Corp and China's Contemporary Amperex Technology (CATL) in looking to locate battery plants in Europe. South Korea's LG Chem and Samsung SDI have European factories due to open soon while China's GSR Capital already produces battery cells at a UK plant it bought from Nissan. "We have to move fast because here we are in a global race. We need to prevent technological dependence on competitors," European Commission Vice President Maros Sefcovic said at the launch of the European Battery Alliance's action plan in May. But some investors say they are wary of backing European EV battery suppliers after seeing local solar panel producers founder in the face of cheap Chinese imports over the past decade. European battery companies would need billions in EU support to rival Asian companies that have received similar state subsidies, and Brussels may be better off promoting next-generation solid-state EV batteries instead, investors say. "I don't believe anyone in Europe can be competitive with the Asians," said Gerard Reid, founder of Alexa Capital, which advises companies in the energy, technology and power infrastructure sectors. Carmakers in Europe have been importing batteries from Asia, but as production accelerates that strategy will become less viable. Setting up production in Europe would cut shipping costs by one-quarter, said consultancy P3 Group. But some carmakers are not waiting for a European industry, instead signing contracts with Asian companies coming into the region. German's BMW said it was not involved in the European alliance while Europe's biggest automaker, Volkswagen, said it plans to get batteries from LG Chem's Polish factory. Mercedes maker Daimler has awarded a contract to CATL. The European Commission's plan calls for 110 million euros in battery-related research, help for projects from a 2.7 billion euro EU innovation fund and the development of an EU "green battery" trademark. Northvolt's first financing round, intended to raise 80 million euros to 100 million euros to help set up a test factory, took slightly longer than expected, a spokesman said. Much of the profit from the battery value chain is generated by producers of raw materials, such as cobalt and lithium, and those who assemble cells into complex systems, experts said. Northvolt and TerraE will probably need about $2 billion each in government funding to build their gigafactories, given the state support provided for similar projects in Asia and the US, said Asad Farid, an associate director at private bank Berenberg who specializes in battery technology. Four months after the European alliance launch, the world's biggest automotive supplier, Germany's Robert Bosch, abandoned plans to make battery cells, saying it was too risky. Investors are wary because of their experience with solar panel makers as well as rapid advances in technology that are slashing the price of battery packs, which consultants Arthur D puts at $190 to $250 per kilowatt hour. "In battery manufacturing... it's very much about scale. So established producers in South Korea, China and Japan have clear advantages over new entrants," said Simon Webber, lead portfolio manager on the global and international equities team at Schroders. Tim Crockford, who manages Hermes Investment Management's Impact Opportunities Fund, said he was more interested in European companies that are researching cathode technology, areas with major barriers to entry in terms of R&D. "The attraction of the industry decreases as you move further down the value chain. Things like battery manufacturers and the battery pack assemblers ... it's much more fragmented market with lower barriers to entry," said Crockford. While Hermes has avoided companies mass-producing EV cell batteries, it has taken stakes in a lithium producer as well as a company that makes materials for battery cathodes, he said. "The development cycle and the speed of technology progress in batteries is so huge at the moment, there's an opportunity for new and additional players to enter," said Timo Moeller, head of the McKinsey Center for Future Mobility in Cologne. Developers in Europe believe that gives the region a chance to catch up. "Everybody is developing solid-state batteries so the gap [with Asia] will be narrower and narrower as we go along," said Diego Pavia, CEO of InnoEnergy, a sustainable energy company that has invested in Northvolt.